Calm, even-tempered and intelligent, Blue Picardy Spaniel's very much enjoy the company of their owners. They are gentle with children, making great pets. Rustic looking, relatively tall and powerfully built, the Blue Picardy Spaniel trains well. Training should be gentle, firm and consistent. They need human companionship and lots of exercise. Known and appreciated for its hunting skills, the Blue Picardy Spaniel works very well on rugged terrain and in the water as a flusher. This breed tends to score well in field trials. 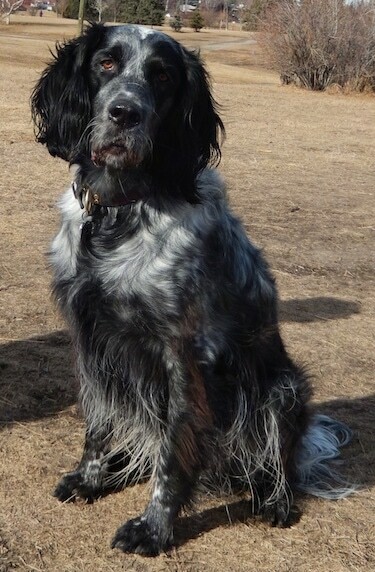 Blue Picardy Spaniel's have an excellent nose and are great at locating and retrieving game under most adverse conditions. They are enthusiastic hunting dogs, persistent, hardy and courageous. This breed gets along well with other dogs. It is important owners are even-tempered, but firm and consistent with the rules set upon the dog. It is also equally important, when the dog is not hunting, that he receives daily pack walks where he heels beside the handler during the walk. When a dog is lacking in either leadership and or proper mental/physical exercise it causes separation anxiety. This breed is prone to ear infections. The Blue Picardy Spaniel is not recommended for apartment life unless it is actively working or getting dailiy pack walks. If underexercised or bored they can be very active indoors. They do best with acreage. Blue Picardy Spaniel's love exercise and have great stamina. They need daily extensive exercise, including a walk or jog and do best with an active outdoor person or hunter. This breed will enjoy running free in the safety of a fenced yard. Regular brushing twice a week of the medium-length, flat coat is really all that is needed to keep it in good condition. Bathe or dry shampoo when necessary. It is generally a low-maintenance dog. Check and clean the ears carefully, especially when the dog has been out in rough or brushy terrain. Trim the hair on the bottom of the feet and clip the nails. This breed is an average shedder. The Blue Picardy Spaniel originates from France, and is a descendent of the Picardy Spaniel and the English Setter.